Not too long ago bars and kitchens had an often-adversarial relationship, particularly when it came to bars pilfering ingredients and not replacing them, or kitchens being stingy with the supply. There was also a more substantial standoff at work in the bad old days of drinking, as Charles Draghi, chef and owner of Erbaluce explains. “For a chef, I was never a fan of cocktails, like a lot of chefs. It used to mean a war between bar and customer’s palate and what chef was trying to do.” Too many cocktails, before the current resurgence, were cloyingly sweet, or else overpoweringly alcoholic. You wouldn’t want a diner to be drinking mudslides, say, or straight vodka martinis before a nice meal. But that all changed when bartenders and chefs realized they could work together to enhance the entire experience from first sip, on through the meal, and to the after-dinner drink. “I think for us it comes down to what’s in season,” says Scott Shoer, of the interplay between his bar and the kitchen. “I tend to look at what they’re doing, what’s coming onto the menu, and say, ‘Ok, they’re using cranberries,’ or whatever the case may be, and try to take that and say, ‘How can I utilize that in the front of house, to incorporate it into liquid form?’” That means infusions, macerations, cooking things down, and making syrups or oils. With cranberries he devised an update on a Cape Codder, an oft-maligned cocktail. “They’re delicious!” he says. “Everybody who’s ever had a cocktail has had one.” Not like this probably. Of course, they can’t get everything they need, and seasonal availability comes into play, but they might be growing Thai basil, edible flowers, Japanese eggplant, kale, baby bok choy, or cherry tomatoes depending on the time of year. During the summer, they had a cocktail called the Garden Goblet that used their green tomatoes, with fresh basil, vodka, and soda. “It has a nice fresh salad taste to it, very light and easy to drink.” “Right now, because of cold weather, we can get rosemary and things like that, so we’re doing a blood orange Cosmo with rosemary simple syrup, blood orange puree, vodka, triple sec, and garnished with a sprig of rosemary.” For the colder months, they take fresh cranberries, simmer them in bourbon, cook that off with apple cider, lemon juice, cinnamon, nutmeg, and allspice for a syrup, and add it back in with more cider and bourbon. Working on drinks for the bar was a necessity when he first opened, says chef/owner Charles Draghi of Erbaluce—they didn’t have a big enough bar staff to get everything done. That opened up his appreciation for what could be done with his culinary talents in liquid form. Draghi, who pulls ingredients from a market each day before service, often finds another home for them, whether it’s fresh fruit, or seasonal things like pumpkin. And from there, he comes up with dishes that pair with the drinks. For example, a Matsutake Flip cocktail he might present with a mid-course salad with the sliced and torched mushrooms, Taleggio, arugula, lemon, and olive oil. To prepare the cocktail, he’ll peel the outer skin off the mushrooms and throw them and some stems in a jar with bourbon. The extract ends up with a sort of Marsala-like flavor, with some maple and mushroom that creeps in on the backend of the drink, which also takes a shaken, frothed whole duck egg, lemon, a touch of honey, and grated nutmeg. 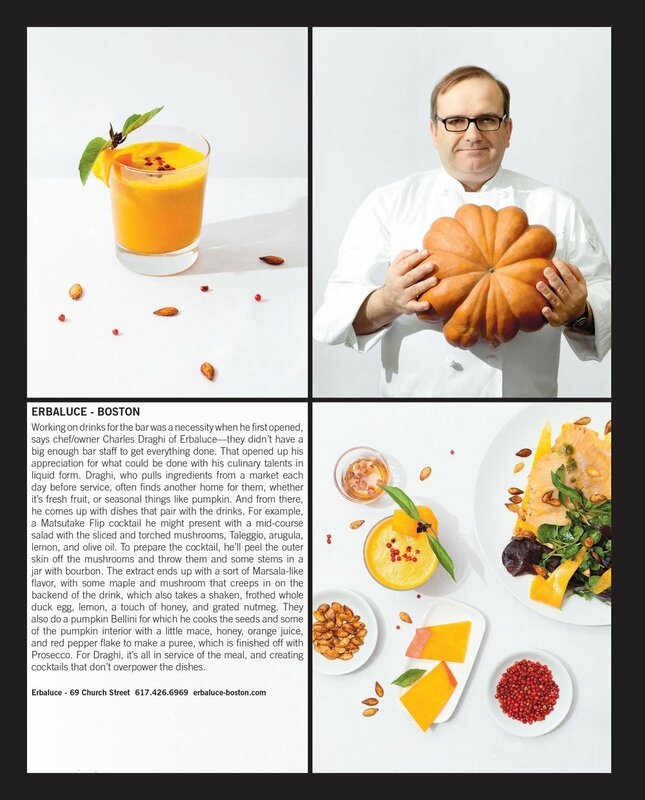 They also do a pumpkin Bellini for which he cooks the seeds and some of the pumpkin interior with a little mace, honey, orange juice, and red pepper flake to make a puree, which is finished off with Prosecco. For Draghi, it’s all in service of the meal, and creating cocktails that don’t overpower the dishes. “One of the most important themes of our bar program is a marriage of kitchen to cocktail program,” says Vikram Hegde of Sarma, the Somerville offshoot of the longtime Cambridge favorite Oleana. That’s what made him want to come on board in the first place. “I went into Oleana and they showed me the types of spices they were using. I wanted to make that the feature in the cocktail program, that really spoke to me. As such, we have a great deal of access to the herbs and spice blends that make our food really unique.” Among those are cocktails that feature flavor profiles from around the Mediterranean and Middle East, from Turkey, Lebanon, Syria, Greece, and Morocco. Some past recipes included one sweetened with mastic, a piney, herbaceous resin used in a lot of Greek and Mediterranean cuisine, and a Pimm’s Cup made with Aleppo chili from Syria. Lately Hedge is infusing tequila with Urfa chili, and has an Old Fashioned riff that takes bourbon infused with fenugreek and pineapple. “It adds a tropical element from the pineapple and a unique twist with the addition of fenugreek, which imparts an earthy herbaciousness, but most of all a warm, maple syrup like flavor,” he says. Brett Henderson, beverage director of Ceia Kitchen + Bar and Brine in Newburyport, has a tight relationship with chef Patrick Soucy when it comes to finding inspiration for his cocktails. “Patrick works with quite a few farms, so whenever he brings in produce, fresh ingredients, we bang our heads together to see what might work with cocktails.” After trying some of the beets from Soucy’s own garden, Henderson wanted to try working them into a recipe of his own. He considered a borscht-style drink, “but borscht kind of turns people off, so I made it more fun, sweeter.” He picked up a batch from the nearby Tendercrop Farm and infused them into Green Mountain vodka from Vermont. “The color bled right into it, with the flavor tasting like we’d just blended a beet.” For sweetness, which has to be kept in mind for cocktails up in that neck of the woods, he says, he added Canton ginger liqueur and ginger syrup. “It’s almost like you took a beet and candied it without adding any kind of additional sugar,” he says. As it turned out, the refreshing end result paired perfectly with chef Corey Marcoux’s menu at Brine. When a restaurant is putting out high quality dishes, like chef and owner Matt O’Neil and his team do at the Blue Ox in Lynn, an attentive bartender can’t help but take notice. “Matt’s food is fantastic, coming from No. 9 Park, he’s super creative, but they’re simple dishes with little twists, and impeccably sourced ingredients is our thing,” says general manager and bar director Charlie Gaeta. “It’s funny, the bar’s proximity to the open kitchen, you see a lot of stuff they’re using and you get inspired.” That means when the kitchen started using whiskey barrels from the nearby Ryan & Wood Distillery to smoke a filet mignon, Gaeta figured he’d get in on the fun and try smoking bourbon. He takes the chopped up barrel chips, lights them, then layers a few pans of ice between the heat and the bourbon, so as to not cook off the alcohol. The result is a smoky sip that pairs perfectly with the filet. For the Hot N’ Dirty cocktail he employs the hot sauce of choice in any good kitchen, Sriracha, and local pickles from Maitland Mountain Farm in Salem, whose namesake Holly Maitland works as a server in the restaurant. “It’s taking a kitchen ingredient, food product, and incorporating it into a savory cocktail,” he says, one which also uses the local Knockabout gin. 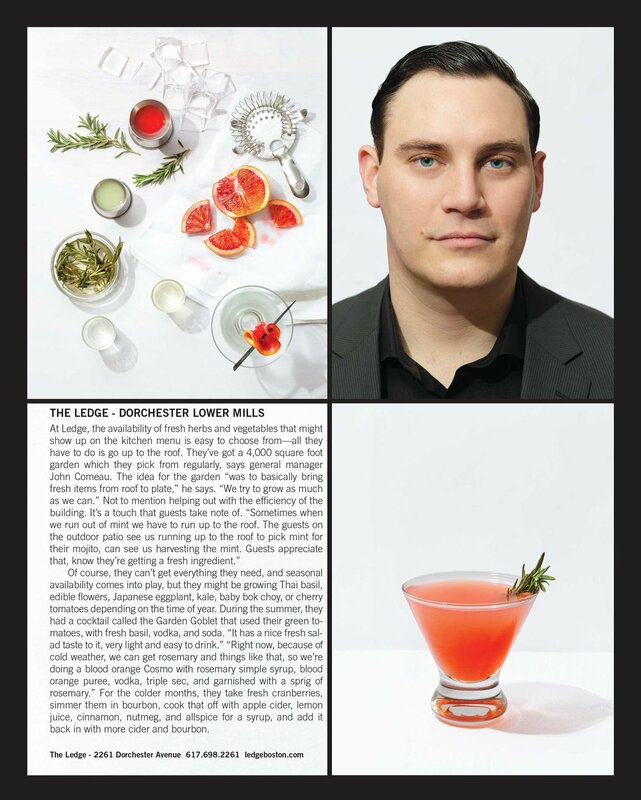 Luke O’Neil writes about bars and cocktails for the Boston Globe and Boston Metro. He wrote the book Boston’s Best Dive Bars, Drinking and Diving in Beantown. Find him at @lukeoneil47 on Twitter. 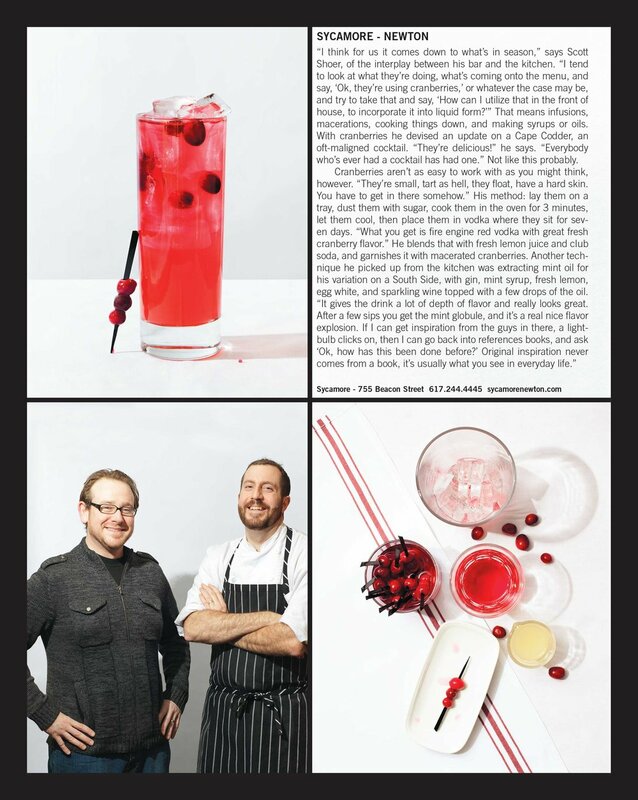 This story appeared in the Drinks issue, February 2014.